For bath time fun that fits the bill, this colorful set is the perfect choice. Children can take it apart, and put it back together in several configurations, but it also floats or holds water, so the fun doesn't end there. Spill water over the green spinner to watch the wings flap, or use the two larger cups to collect and pour water in any location. The blue and magenta body parts also float like boats, and the floppy feet are made from pure silicone, so they suction in place. Watch the duck wobble as it sticks to the side of your tub, or let it dive right in to swim amongst the bubbles. 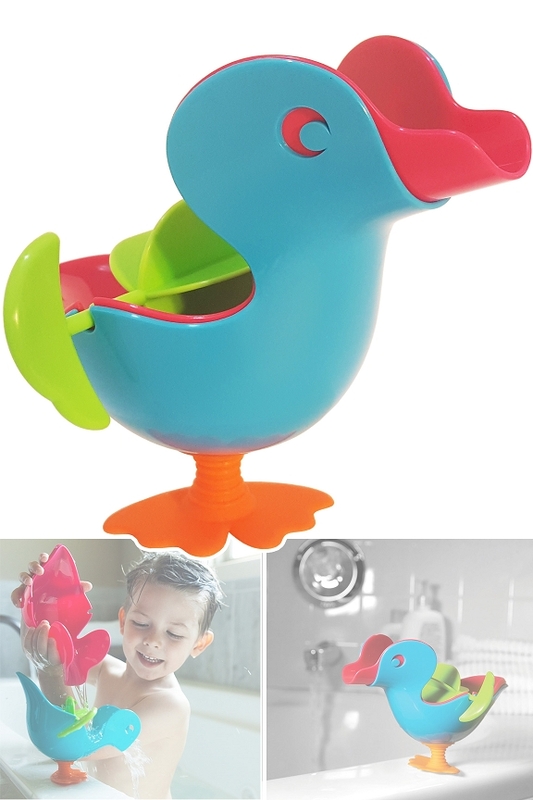 Kids will have fun in a variety of ways when this stackable, duck-shaped toy is added to the bath. Colorful. Each piece is a different color, and the vibrant look catches the attention of any child. They can easily differentiate each part which helps to solve the stacking puzzle, and despite the bright hues, it still has a look that mimics nature. Educational. Problem solving begins when they try to restack the parts, and gross motor skills are improved as they try to pour water in the perfect spot to make the wings spin as fast as possible. Teach about color, and help them improve a number of vital skills all while quaking like a duck and having fun. Versatile Play. Cups to collect and pour, boats to float, or a feathered friend to sing songs and converse with while bathing. 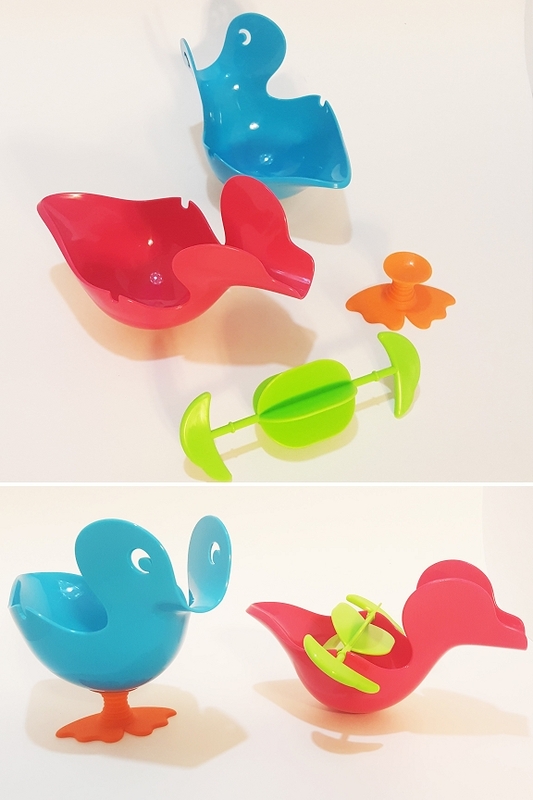 This clever toy is fun when all the parts are nested and connected to make the duck, but each one can be just as fun on its own, or when used together in different ways. Moving Parts. Wobbly feet allow it to wiggle and waddle while standing in place, and when you pour water over the wings, they spin like a water wheel. Simple, moveable parts make the Quack Stack Bath Toy engaging. Color Multiple: magenta, blue, green, and orange. 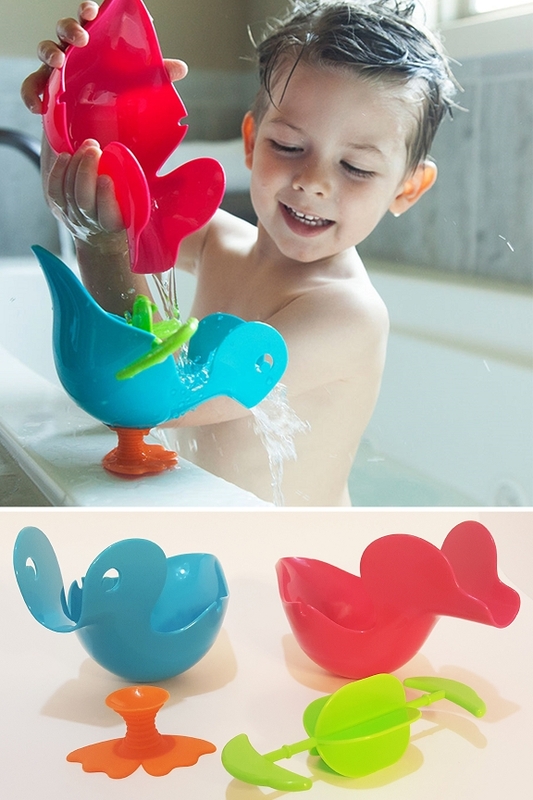 A clever stacking and pouring toy to make bath time fun. Nest the pieces to make a duck, or take them apart to have two boats, or a set of floating cups with a removable water wheel. Order Yours Today!